Hyundai Forklift of Southern California: Has your forklift maintenance been like the Kardashian marriage? Has your forklift maintenance been like the Kardashian marriage? Has your forklift maintenance been like the Kardashian marriage? Did you get lots of hype and attention and then only 72 days of bliss? Does your maintenance company only care about the money and publicity and not about you? It doesn’t have to be that way. Your relationship with your forklift maintenance company needs to be like a marriage. It should be a two way process where each side contributes to and cares about the longevity and success of your equipment. First of all, your maintenance program needs to be honest and complete. You don’t want to be cheated on and only get partial maintenance done on your equipment, so ask your maintenance provider to review their maintenance program with you. Make sure that their program is customized to match your specific equipment, your environment, and your work habits. A good maintenance program not only includes a complete oil change and lubrication but also a thorough inspection and cleaning of your forklift. Secondly, is your maintenance company keeping track of your forklift’s characteristics, its history and important anniversaries? If Kris Humphries had paid attention, he would have known that Kim Kardashian was not going to move to Minnesota and be a stay at home mom. Same goes with your forklift. 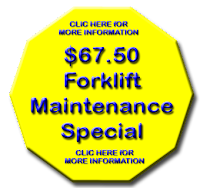 Your maintenance company should know what your forklift’s needs and its maintenance anniversaries. The technicians should arrive fully prepared to make the most out of the time they spend doing maintenance on your lift. Third, a maintenance company should take the necessary steps to protect you. They should provide competent and trained personnel to do your forklift maintenance. Their employees should be properly insured with Work Comp insurance so that if their employee is injured on your property, you won’t be liable in any way. They should also take responsibility for any damage or accidents that may happen as a result of their work. You need to make sure that your forklift maintenance company carries an appropriate liability insurance policy to keep you protected. Of course, as in marriage, this is a partnership and you have responsibilities too. You are responsible for clearly communicating to your partner how your forklift is running and any issues you are having or may have observed. Without clear communication, your maintenance partner has no way of knowing if they are doing a good job or if you are satisfied as a customer. Finally, you need to make sure that you properly compensate your forklift maintenance company. Any good marriage requires that each side makes equal contribution to the relationship. To keep the relationship healthy for the long-term, you can’t expect to get more from your partner than you are providing in return. Wondering a way to want a fresh family with some wonderful quotes? regardless of what nice gift is wrapped for the marriage couple, a number of personalized and fond words can build heaps of distinction. If you're lacking words to speak your greetings, here area unit few best collections of wedding quotes and short desires for fresh wed couples.Customize these as per your demand by adding names and unforgettable events and share with the couple to visualize the thrill in their eyes.Marriage between 2 folks signifies the bond of their unification. could the happiness and love that you simply 2 share still be like that of the sands within the ocean.A beautiful wedding is after you keep falling crazy with identical person once more and once more.